You know, after Midnight in Paris I developed a newfound respect for Owen Wilson as an actor and have been anticipating how the role would redirect his career. Long story short: it doesn't appear to have had any effect at all (see the horrid triple header: The Internship, The Grand Budapest Hotel and Inherent Vice). But his new film, an actioner co-starring Lake Bell and Pierce Brosnan, might get me to pay attention to him again as he returns to another more mature role. NO ESCAPE, directed by John Erick Dowdle (Quarantine, As Above, So Below), is set in Asia and follows an unsuspecting family of four as scramble for safety after they find themselves smack dab in the center of a violent political uprising. 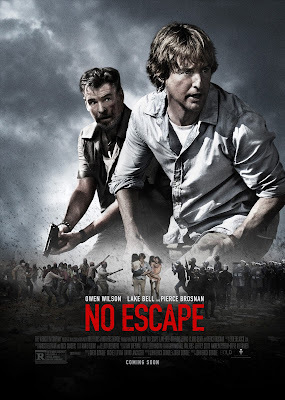 NO ESCAPE hits theaters August 26.